Tim Hansen and Jacob Folsom... Jonesin' music is talented acoustic instrumentation and vocal harmony; a soft-rock, bluegrassy, love song, easy listening, emotion heightening music. 5. How Much Does a Soul Cost? Jonesin', the acoustic duo of Tim Hansen and Jacob Folsom, got together in Utah in the summer of 2003. Tim and Jacob got started by writing little ditties in their apartment on Sunday afternoons after church. Then, one day they broke out with their first song,"No More". They performed it for friends and neighbors; everyone was impressed at the emotional and real-life lyrics, and the second their two voices started to harmonize....they caught everyone's attention. After writing many more songs together and doing some local gigs, jonesin' recorded their self'debuting album in the winter/spring of 2003. This album was produced by Russ Dixon from the group Colors and features many extremely talented guest artists such as: Ryan Shupe, David Tolk, Rich Dixon, Craig Poole, and Craig Minor. The album was a smash success locally, and now it is being marketed to the world on CDBABY! 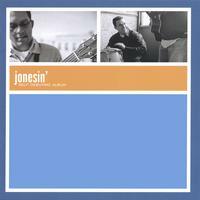 So, sit back and enjoy the rich acoustic harmonies of jonesin'. Oh, by the way...jonesin', by definition means: a persistant emotional yearning! The music on this CD was great. My wife Laura and I listen to it all of the time. The music is everything from relaxing to inspiring. I would recommend it to everyone. I am continually amazed by the talent that there is right here in the State of Utah!! More people need to buy this CD and enjoy these artists. The CD was very fun and relaxing all at the same time! Congratulations on a hit!!! I thought your cd was amazing! My fav songs are the third and the last, but they were all very well done. Not only were the lyrics catchy and meaningful, I could tell by the instramentation that there was a lot of work and passion put into this cd. I would recommend this cd to anyone who appreciates good, quality music!